This post was updated on Dec 8, 2017. What genes are important in your phenotype of interest? Many scientists study diseases for which the underlying genetic cause is not entirely known. Identifying which genes are important for a phenotype can lead to a wealth of additional experiments investigating the role of individual genes or entire pathways in a particular disease process. While CRISPR is certainly not the first means to carry out so-called “forward genetic screening experiments”, it is certainly the most robust. In this blog post, we will discuss how CRISPR libraries are being used to perform genome-wide screens and highlight some of the reagents that have been made publicly available through Addgene. What Makes CRISPR So Special? A major advantage of CRISPR/Cas9 over previous genome editing techniques is its simplicity and versatility. CRISPR/Cas9 consists of two components: the non-specific endonuclease (Cas9) and a single stranded guide RNA (gRNA). The ~20 nucleotide targeting sequence within the gRNA is defined by the user, and it can be easily modified to target Cas9 to virtually any genomic locus, provided the target is unique compared to the rest of the genome and located immediately 5’ to a protospacer adjacent motif (PAM) sequence. Co-delivery of wild-type Cas9 and a gRNA generates a double-strand break in the target DNA, which, when repaired through error-prone non-homologous end joining (NHEJ), usually results in a loss-of-function mutation within the target gene. CRISPR can also be used to activate or repress target genes without permanently modifying the genome. If you'd like to brush up on the various CRISPR technologies, check out Addgene's CRISPR Guide. What CRISPR-based Reagents Are Available for Genome-wide Screens? The goal of a genome-wide screening experiment is to generate and screen a population of mutant cells to identify genes involved in a particular phenotype. CRISPR can be readily scaled up for genome-wide screening due to the broad range of potential target sequences and ease of generating gRNA-containing plasmids. CRISPR genome wide-screening experiments commonly use lentivirus to deliver a pooled population of gRNAs to Cas9 expressing cells. Pooled lentiviral CRISPR libraries (referred to simply as “CRISPR libraries”) consist of a heterogeneous population of gRNA-containing lentiviral transfer vectors, each targeting a specific gene within the genome (see Fig. 2). Individual gRNAs are designed in silico using publicly available gRNA design software and synthesized. Pooled gRNAs are then cloned into a lentiviral transfer vector to create the CRISPR library. CRISPR libraries have been created to knock out, activate or repress target genes by combining a gRNA library with the aforementioned derivatives of Cas9. Several CRISPR libraries are publicly available through Addgene, with more being added all the time. Keep in mind that libraries are only as good as the experiments you use them for! A well-developed biological question and experimental system are absolutely necessary to ensure that you select the correct CRISPR library. There are several factors to consider when selecting a CRISPR library for your experiments. 1. What species are your cells derived from? Currently, Addgene carries CRISPR libraries that target mouse, human, fly, and T. gondii genes. 2) What genetic modification are you trying to make? Addgene carries CRISPR libraries for gene knockout, activation, repression, and barcoding. 3) Are you trying to target every gene in the genome, or a specific class of genes? Addgene currently carries several genome-wide CRISPR libraries and a selection of sub-libraries targeting specific classes of human genes. What Are the Steps Involved in a CRISPR Screen? Performing a forward genetic screen using CRISPR libraries is a multi-step process (see Fig. 2). In most cases, CRISPR libraries are provided at a concentration that is too low for experimental use. Thus, the first step is to amplify your library to a concentration that is sufficient to generate lentivirus. Be sure to use next-generation sequencing to check the quality of your amplication. If you've obtained a ready-to-use lentiviral preparation from Addgene, you can skip the steps above! 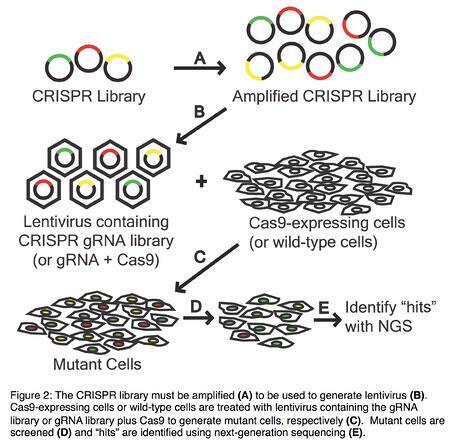 Cells are then transduced with lentivirus containing the CRISPR library to generate a heterogeneous population of mutant cells, with each cell or set of cells containing a mutation in a different gene. Libraries may be available in a 1-plasmid system, in which Cas9 is included on the gRNA-containing plasmid, or a 2-plasmid system in which Cas9 must be delivered separately. Mutant cells are enriched using either drug selection or fluorescence-based cell sorting and screened for a particular phenotype. For example, mutant cells can be used in drug screens to identify genes that confer drug-resistance. Here, mutant cells are treated with a drug of interest and gRNA distribution is analyzed in the drug-resistant population compared to a non-treated control group. In this scenario, gRNAs that are “enriched” correspond to genes that confer drug resistance when mutated. Findings from this type of experiment can shed light on the mechanism by which cells gain resistance to drugs and can identify future therapeutic targets for diseases causing uncontrolled cell growth, such as cancer. Next-generation sequencing - CRISPR libraries contain thousands of gRNA plasmids, discerned only by a unique barcode on each plasmid. As such, sequencing CRISPR libraries after amplification and after a screen requires the use of next-generation sequencing. Representation - Most libraries contain 3-6 gRNAs per target gene, and maintaining the distribution of each gRNA within the population is key. Loss of representation due to enrichment or depletion of specific gRNAs can lead to skewed results. Selecting a cell type - Theoretically, any cell type can be used in a CRISPR screen. However, maintaining sufficient representation within your mutant population requires a massive amount of cells as starting material. Therefore, cell types that are of low abundance are not particularly well suited for genome-wide screening. Avoid false positives and false negatives – As with any experiment, the use of appropriate controls, multiple replicates and several cell types can strengthen your results. Enrichment or depletion of multiple gRNAs targeting the same gene can be strong evidence that a particular gene is actually important for a given phenotype. Each hit from the screen should be independently validated to ensure that the desired modification produces the phenotype you screened for in the first place. With the proper experimental design and validation practices, CRISPR libraries can help you learn a lot about your phenotype of interest. To learn a bit about how CRISPR/Cas9 can be used in other types of experiments, check out our CRISPR Plasmids and Resources Page.